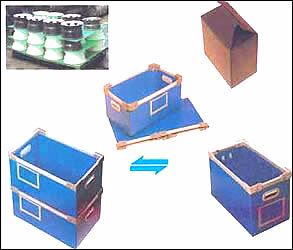 We manufacturer corrugated boxes from polypropylene sheets. These sheets are made from impact co-polymer of PP, which is an extruded hollow profile consisting of two flat wall connected by vertical ribs. Box made out of the sheet are Strong , Light weight, Water & Chemical proof, Food grade, Insulated, Impact resistant and Tearing resistant. These boxes are excellent for Export oriented units to pack goods.